As a newcomer to the appliance arena, Samsung manufactures some of best top load washers and dryers on the market. Top load Samsung washers feature a large number of custom cycles and unique options, plus adaptable settings that speak to the brand’s history in high-tech designs. And don’t get us wrong; these cutting-edge features are appealing and can make doing laundry faster and easier. Best known for personal electronics, phones and connected tvs, Samsung has taken an aggressive approach to make their mark in the appliance industry. We're cutting through the marketing lingo to help you save time and effort when purchasing a washer & dryer set from Samsung. WA45N3050AW 27" 4.5 cu. ft. 700 RPM top load washer with Self Clean. Available with Electric or Gas dryers. WA45M7050AW 27" 4.5 cu. ft. 800 RPM top load washer. EnergyStar Certified. VRT Plus™ Technology to reduce vibration and noise. Available with Electric or Gas dryers. WA50M7450AW 27" 5.0 cu. ft. top load washer - in White and Stainless Steel look. Packs SmartCare the wi-fi enabled troubleshooting app. Available with Electric or Gas dryers with Steam. WA52M7750AW 27" 5.2 cu. ft. top load washer in White and Black Stainless Steel. Features ActiveWash built in sink and Steam technology. Available with Electric or Gas dryers with Steam. WA52M8650AV 27" 5.2 cu. ft. top load washer with modern control panel - in White and Black Stainless Steel. SuperSpeed option for 36 minute-clean. Available with Electric or Gas dryers with Steam. WA54M8750AV 27" 5.4 cu. ft. -largest capacity- Samsung top lad washer - in White and Black Stainless Steel. Full Wifi Connectivity. Available with mega capacity 7.4 cu. ft. Electric or Gas dryers with Steam. Samsung FlexWash washers and dryers incorporate the best of front-load washing with a smaller size top load washer. Same flexibility is carried over to the dryer. This truely innovative technology allows you to handle 4 loads at the same time to cut-down on your chores. A top load washer or dryer can have all the fancy technology upgrades in the world, but if it doesn’t wash or dry clothes effectively, then it doesn’t amount to much. Fortunately, Samsung models bring both. You now have a wide range of cycles at your disposal for handling different clothing types and soiling levels. You can even control the spin rate of your washer. Whatever the condition of your clothes, Samsung has the perfect solution for cleaning them. Some of the most distinct features in Samsung’s top-load machines include 12 cycles, such as Super Speed, Bedding/Waterproof, Permanent Press, Steam Sanitize, Quick Wash, and Deep Wash. You’ll also enjoy additional options like Self Clean, Pre-Soak, Extra Rinse, Fabric Softener, Smart Care (which troubleshoots and diagnoses any issues), and Eco Plus for a more eco-friendly alternative. swirl interior provides small water holes to treat your clothes the same way you would treat them with care and gentleness. Matching dryers in the Samsung set can reach up to 12 cycles: Steam Refresh, Steam Sanitize, Steam Wrinkle Away, Normal, Heavy Duty, Permanent Press, Bedding, Delicates, Active Wear, Time Dry, Air Fluff, and Quick Dry. These cycles are backed up by 12 additional options that include Mixed Load Bell, Wrinkle Prevent, Adjust Time (Up), Adjust Time (Down), My Cycle, Child Lock, Sound On/Off, Anti-Static, Eco Dry, Smart Care, Drum Light, and Smart Control. With the power of Multi-Steam technology, Samsung dryer can eliminate stains and odors dependably no matter how severe they might be, all while leaving your clothes wrinkle-free and totally dry at the end of each cycle. That dependable dryness is all thanks to Samsung’s Sensor Dry feature, because they recognize that nothing is worse than finding wet or damp clothes at the end of a drying cycle. Sensor Dry senses what’s required for each load, then adapts the temperature and drying cycle duration to give the perfect drying performance you need. Energy efficiency has become vitally important. But many top loading washers consume twice the energy of the average front loader. However, Samsung foregoes the use of an agitator in their machines—the primary cause of inefficiency in top loaders. As a result, most Samsung models are Energy Star Qualified and exceed all government standards for energy saving design. Samsung provides both top and front load washers. Front load washers are generally gentler on fabrics, but Samsung top load washers have features that combat this imbalance. First of all, they have no agitator which means no central post to disturb clothes during cycles. Meanwhile, the diamond drum and swirl drum machines are designed to be gentle on fabrics with their small water drain holes. In general, top load washers are also less expensive than front loaders. Please check here for more information about top and front load washers and which one will suit your needs. Samsung top load washers feature VRT Plus Technology, and it's absolutely a feature you'll want to look out for when choosing the machine for you. What is VRT Plus Technology? It’s a vibration-reducing system that combines a revolutionary tub design with dedicated sensors so that your washing loads stay balanced even when spinning at high speeds. As a result, even running a laundry upstairs while children are sleeping won’t result in disruptions. Samsung top load washers vary in size, with value and base models starting at 27” wide and 46” tall. Deluxe models reach as much as 29” in width and 46” high, which may be a problem if you are somewhat on the short side. Premium models are sized at 27” wide and 42” tall. Keep in mind that when pairing your top load washer with a dryer, you’ll need approximately one inch of space between the two for functional operation. The best way to arrange your machines is with 6” of space between the wall and the back of the machine, plus 21” of space above the machine lid to open smoothly. It should come as no surprise that Samsung is as committed to innovation in their washers and dryers as they are in their other tech products. As a result, they offer a suite of connectivity features that tech-heads will love. These include Smart Care technology that lets you troubleshoot any issues directly from your phone and offer quick solutions. The aim of features like this is to make managing your laundry process something you can do from anywhere in the home. The WA54M8750 comes with built-in WiFi to connect your washer to your mobile device. This allows you to monitor how much time is remaining in a cycle, get alerted when a cycle finishes, and even schedule your cycles to start at designated times. Whether you're downstairs or out of the house, you'll always know the status of your laundry. Because Samsung tends to use special terms to describe the features and cycles of their top load machines, let's take a look at some of these terms so you know exactly what they mean while shopping. Samsung Top Load Washer High Efficiency (HE) Technology Explained: Samsung top load washers are built with the modern HE technology and do not feature an agitator which is harsh on clothes. Instead Samsung uses an impeller which saves energy and water. Samsung top load washers with HE technology have faster spin rate than that of top loaders with an agitator. This means that more water is extracted in the washer which in turn cuts down the time in dryer, i.e. time savings for you. Self Clean: The machine cleans its tub by spinning and soaking. Killing bacteria without using harsh chemicals. The washer even reminds the customer to clean tub every forty cycles. VRT Plus™ Technology: Reduces vibration 40% more than standard VRT™ for quiet washing. Quieter operation, particularly when washer is located on a top floor with a living space below. EZ Drawer Dispenser: Conveniently placed detergent drawer with ball bearing glides. Features trays for dispensing main wash, fabric softener and bleach. Smart Care: Allows you to be alerted of issues with your washer or dryer and troubleshoot them directly from your smartphone. Activewash™: This is essentially a built-in faucet inside the washer, where you can do some initial pre-wash work and stain removal. Scrub and soak your clothes with a powerful jet of water, then instantly let your items fall into the washer for their wash. Steam Wash: Steam is a powerful agent for removing stains without any pre-treating. Samsung uses steam that’s released from the bottom of the tub and passes through clothing for a deep stain-removing clean. Super Speed: Wash a full load in as little as 36 minutes. Select Super Speed to power through laundry 35% faster without sacrificing cleaning performance. Normal 56-minute cycles can now be completed in as little as 36 minutes. Diamond Drum: This feature provides an ideal environment for the gentle washing of clothes using a special surface that helps prevent fabrics from getting stuck and becoming damaged. Embossed washboard surface reduces the chances of the textile area being exposed to harmful effects of washing by conventional washing machine drums by 35%. With the Diamond Drum, the water exit holes are both 25% smaller and located deep within each diamond-shaped depression to prevent fabrics from getting stuck and consequently being damaged. Swirl Drum Interior: This enhanced swirl interior helps extend clothing life by treating fabrics gently. Small water holes help prevent fabrics from snagging and being damaged, allowing fabric care with deep-clean results. Mist Shower: Sprays your laundry with water at the beginning of the rinse cycle to help remove detergent residue. Soft Close Lid: The Soft Close Lid closes safely, gently and silently, so there are no frightening banging sounds and less risk of accidents! Permanent Press: Cycle with a longer, unheated cool-down period to minimize wrinkling of cottons, synthetics, and knits. Spin Only: Cycle that engages a washer's spin mode to remove excess water from garments. No water or soap is added. Quick Wash: Abbreviated 28-minute wash cycle designed for smaller loads and users on the go. My Cycle: Button that activates a user's customized cycle, with preset Dry Level, Temperature, Time, and more. Child Lock: Safety feature that prevents children from using a dryer. When Child Lock is on, buttons won't respond to being pressed. Fabric Softener: Separate dispenser tray for fabric softener. Multi Steam Technology: Uses the power of steam to keep clothes looking and smelling great. MultiSteam™ Technology freshens and sanitizes garments, reduces odors and static, and relaxes wrinkles in clothes so they need less ironing. Eco Dry: Uses up to 25% less energy for every load, offering superior drying power while saving money in the long run. Sensor Dry: This powerful feature allows you to be sure your clothes are properly dry without constantly checking. Sensor Dry automatically optimizes the time and temperature of the drying cycle so clothes are always thoroughly dry without being damaged. Moisture sensors protect your laundry from heat damage and avoid excessive energy use. Vent Sensor: Detects duct blockages and reminds you to clean your vent. Now let's take a look at some of the best products in Samsung's line of washers and dryers and see what makes them great. This model features a Self Clean function as well as the Diamond Drum design to avoid damaging clothes. The 8 wash cycles include Normal, Heavy Duty, Colors/Dark, Delicates/Hand Wash, Quick Wash, Self Clean, Rinse and Spin, and Spin Only. Meanwhile you’ll enjoy two additional options in Extra Rinse and Child Lock. Four temperature settings expand your capabilities further, while energy consumption is kept low and 700 RPM of spin rate allow for dependable spin cycles. Spin Only is also available in this model, as well as the Eco Warm temperature setting and an even lower energy consumption rating. This model can be paired with either the DV40J3000EW or DV40J3000GW. Click here, to purchase this Washer and Dryer set together and get special discounts from our website. For all of the features of the WA45N3050AW plus even more such Enhanced Vibration Reducing Technology VRTplus, Modern Glass Top, 800 RPM Faster Spin cuts down on drying time. This model is Energy Star Certified. WA45N3050AW features an EZ drawer dispenser and four levels of spin intensity, plus three unique soil settings and a Permanent Press option to avoid wrinkles. You’ll also appreciate the Delay End and Presoak options for making laundry day more flexible. This model is Energy Star Qualified with low energy consumption and features an impressive max spin rate of 800 RPM. It also pairs with the DV40J3000EW or DV40J3000GW dryer models which have 7.4 cu. ft. capacity with 9 cycles and 3 temperature settings including wrinkle prevent and sanitize cycles. Click here to buy this Washer and Dryer set together and get special discounts from our website. This model features everything the WA45M7050AW has to offer plus much more. These additional features include 5.0 cubic feet of capacity, plus a Stainless Steel Pulsator for better washing performance and Smart Care connectivity for mobile diagnosis of any issues. Two new cycles arrive in the form of Brilliant Whites and Active Wear, perfect for exercise clothing like sports jerseys and athletic pants. Energy consumption is an impressively low 6,343 gallons/year, and you’ll enjoy the upgraded dryer pairing options: either the DVE50M7450W or the DVG50M7450W. These 7.4 cubic feet dryers feature Multi-Steam technology to steam away wrinkles and odors as well as the Eco Dry mode that uses up to 25% less energy than standard loads. For another step up from the WA50M7450AP, consider the WA52M770AV. It features an even larger capacity (5.2 cubic feet) and a Swirm Drum interior. The finger resistant feature is great for keeping a neat look, and this machine also boasts a Steam Sanitize cycle and three additional options: My Cycle, Fabric Softener and Eco Plus. You'll also receive an even higher temperature setting, Extra Hot, plus an Extra High spin setting and two additional soil settings. For a perfect dryer pair, choose either the DVE50M7450W or the DVG50M7450W. These 7.4 cubic feet dryers feature Multi-Steam technology to steam away wrinkles and odors as well as the Eco Dry mode that uses up to 25% less energy than standard loads. We’re reaching the upper echelon of quality in Samsung machines. The WA52M8650AV features everything its predecessor has to offer, plus a Super Speed wash cycle that can complete a load in as few as 36 minutes. It pairs well with the DVG52M8650V or DVG52M8650W dryers, which offer 7.4 cubic feet of space in an electric or gas model and are available in white. They also boast Multi-Steam Technology for removing wrinkles and odors as well as static cling. This is it—the best of the best. This model features everything its sibling above has to offer and more. It boasts WiFi connectivity to let you remotely control and monitor your Samsung washer and dryer from anywhere using your mobile device. It also boasts integrated touch controls, a dedicated Fabric Softener option and an impressive set of dryer pairs—the DVE52M8750V or DVE52M8750W and even the DVG52M8750V or DVG52M8750W. If you want the best of the best in washing and drying, these are the options for you. Click here to buy this Washer and Dryer together and get special discounts from our website. Samsung has dominated a long list of industries, and now we can begin to add one more to their list. 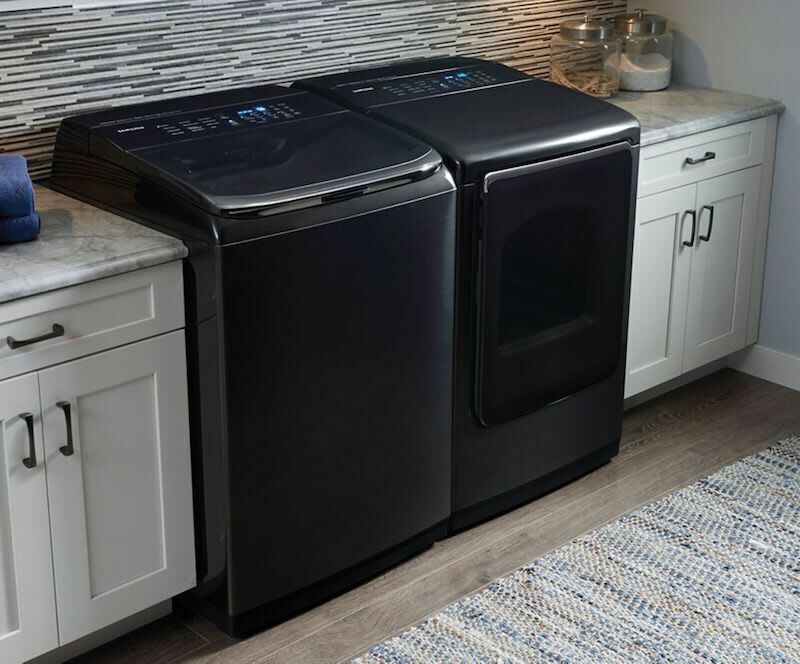 They're offering some of the market's best washers and dryers, and they're doing it with a dedication to high-tech design that doesn't neglect the basics-- top-notch washing and drying power in a durable, dependable package.